Spring is ever so stubbornly making baby steps. We had a high yesterday over the freezing mark for the first time in a week (37 officially yesterday afternoon). Hey, we’ll take any progress towards spring at this point, right? While I’m guessing that many of us wouldn’t mind jumping into spring head-first, this gradual thaw is reducing the potential for major flooding in this part of the country especially considering the areas of “concrete frost” that exist below are deep snowpack. *Courtesy of NWS Twin Cities. Concrete frost is unusually dense frost that forms when very cold temperatures freeze saturated ground. This likely formed in late-December and January following a meltdown of our winter’s first big snowfall around December 10 followed by a sudden cold snap. 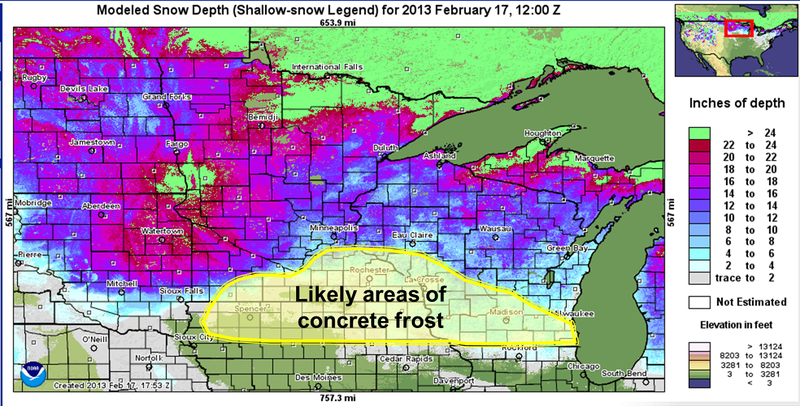 Concrete frost increases the likelihood of flooding as snowmelt and precipitation runoff are unable to be absorbed into the ground where this type of frost exists. So, our odds of flooding this spring have increased in the presence of this frost that likely exists across much of Southern Minnesota in addition to the recent heavy snowpack that has accumulated across most of the state late in the winter season. The good news for flooding concerns at least in the short-term is that I don’t see any MAJOR warm-ups in the foreseeable future nor any heavy precipitation events. Instead, mother nature is going to be making a gradual transition towards spring in the next week. There is a bit of a “fly in the ointment” as we transition towards spring in the shorter term as a large, cold storm system to our south slowly slogs east over the next couple days. Parts of Kansas, Missouri, and Illinois are going to get unusually heavy late-March snow. This area of the country has been in the line of fire for a number of late-winter storms in the past month or so. Once again, some locations may receive up to a foot of heavy, wet snow along a rough line from Kansas City to portions of Central Illinois. 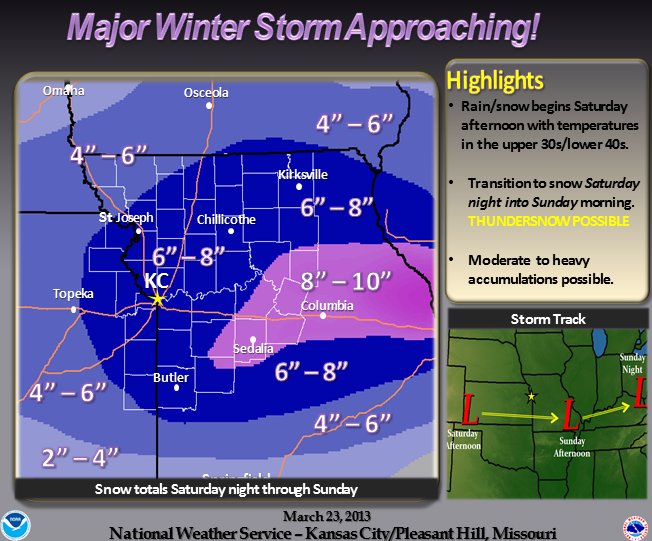 *Courtesy of NWS Kansas City. Fortunately, most of this unwelcome wintry assault will impact areas south of Minnesota. 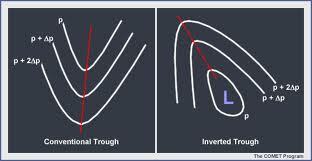 With that said, a weak “inverted trough” will extend northwestward from the main area storminess. This feature may deposit an inch or two of snowfall across portions of Southern and Central Minnesota, mainly south and west of a Little Falls – Twin Cities – La Crosse, WI line on Sunday. This gentle snowfall on Sunday will not be a big deal but a reminder that winter is letting go reluctantly this year ! Today (Saturday) : Filtered sunshine with some high cloudiness. High near 39. Light wind. Tonight : Mainly overcast with a little light snow possible by morning. A low around 26. Light north breeze. Sunday : Cloudy with light snow snow possible (mainly southwest of the cities). Up to an inch of accumulation. High near 34. Light north wind. Sunday Night : Mainly cloudy with flurries possible early. Low around 23. Monday – Friday : early week clouds giving way to increasing sunshine through much of the week. Highs gradually warming from the 30s into the 40s by the end of the work week. Dwindling snowpack slowly melts off. Early glimpse at Easter Weekend : Milder with mainly dry conditions. A slight chance of rain on Easter Sunday. Highs mostly in the 40s. 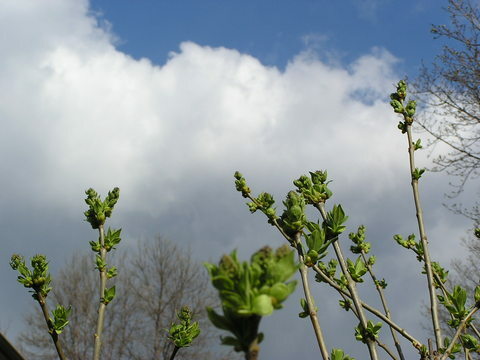 If you’re like me at this point, you’re probably eagerly awaiting spring’s arrival. Unfortunately, this week is going to deliver quite the opposite. A respectful late-season winter storm will blast through later tonight into Monday giving us at least a few inches of fresh snow. The bigger story will be the gusty winds that will follow the snow burst accompanied by increasingly bone-chilling air and numbing windchill readings. By Tuesday morning air temperatures will have plummeted into the single digits in the metro, with readings below zero across much of Western Minnesota. Add in a 15 mph wind, and we’ll be experiencing wind chills well below zero, even in the metro. This will leave many of us scratching our heads wondering if we’ve been thrusted back into the depths of January. The remainder of the week doesn’t give much hope for a quick recovery, as temperatures struggle to climb through the 20s (that’s a solid 15 – 20 degrees below average!) Overnight lows on Tuesday night, Wednesday night, and even Thursday night will dip well into the single digits, with some readings approaching the goose egg even in the cities proper. St. Patty’s Day (today) : sunshine gradually fading away to increasing cloudiness by later this afternoon. Becoming breezy with a high near 25. Tonight : Overcast with snow developing shortly after midnight. Gusty southeast winds 15-20 mph. Temps nearly steady in the mid 20s. 2 – 3 inches of new snow by morning. Monday : Snow through mid-morning, tapering to scattered light snow and snow showers during the afternoon. A morning high around 29 with temps falling into the teens by late afternoon. Gusty west-northwest winds developing midday, with gusts over 30 mph during the afternoon causing blowing and drifting. Wind chill readings falling to near 0. An inch or two of new wind-blown snow, bringing storm totals of 3 – 5″ across the metro. Monday night : A few flurries early, otherwise skies clearing through the night. Blustery west-northwest winds gradually diminishing. Low around 5 by dawn Tuesday. Wind chills dipping well below zero. Tuesday – Friday : Partly – mostly sunny. Unseasonably cold. Highs in the low 20s gradually warming to near 30 by Friday. Overnight lows in the single digits. One last thing – one year ago today the Twin Cities set a record high of 80 degrees on St. Patrick’s Day (earliest 80-degree day in the Twin Cities since modern record-keeping began). This was in the midst of a March heat wave with temps well into the 70s and overnight lows remaining in the balmy 50s to near 60 for several days on end. March has an infamous reputation of producing monstrous spring storms across the U.S. including some memorable blizzards and significant severe weather outbreaks. *Satellite picture of the 1993 Storm of the Century. Locally, early-mid March is state tournament time for basketball and hockey and several years in our state’s history have dished up some blockbuster snowstorms around this time. Consequently, you may have heard the folklore of the “annual tournament blizzard”. But, this is certainly no guarantee as March weather is fickle and varies greatly from year to year. We often go several years on end without getting March snows. 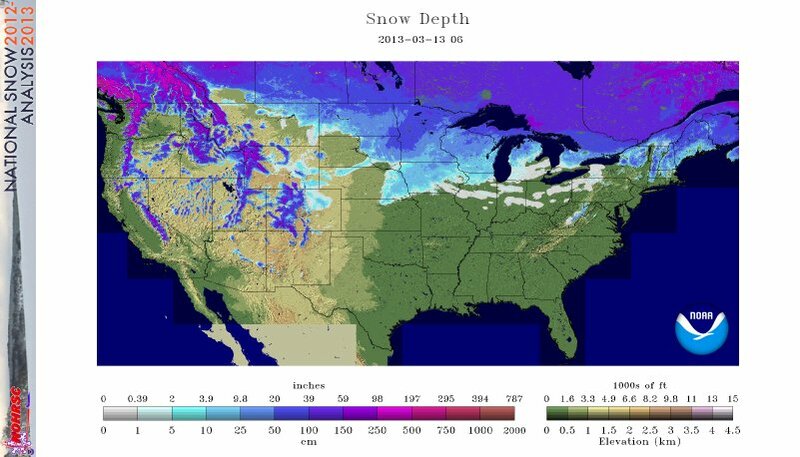 For example, just look at the last several years: no March snowstorms in 2009, 2010 (not a flake of snow that year in March – first time that happened since modern record-keeping began in 1878! ), 2011, and certainly not in 2012. 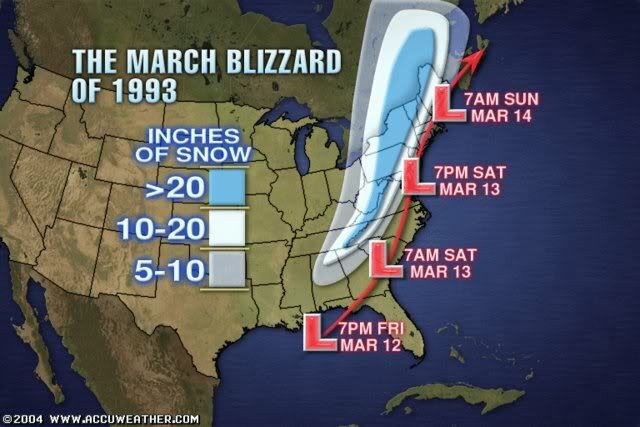 However, this March is shaping up to be a snowy one. We had 9″ officially back on March 4th and 5th. We will likely add to this in the next several days – I’ll get to this later. We Minnesotans aren’t the only ones to fall victim to the Ides of March. 20 years ago today one of the nation’s most powerful and expansive storms struck the Southeast and Eastern Seaboard. The Storm of the Century, or sometimes called the 1993 Superstorm or the Blizzard of 93′ impacted a huge chunk of real estate from the Gulf Coast to Maine. 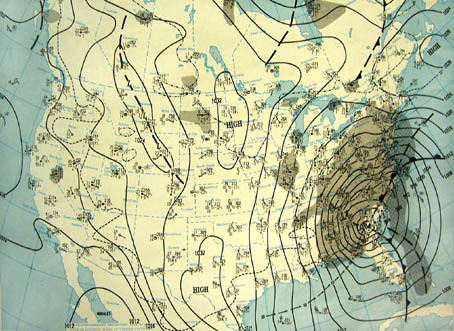 *Surface map for March 13, 1993 displayed the Storm of the Century lifting northeast through Georgia. A deepening area of low pressure formed in the Gulf of Mexico and tracked northeast along the East Coast producing incredible snowfall, hurricane-force winds (some gusts exceeded 100mph! ), and even a tornado outbreak in Florida.
. *A swath of heavy snow fell from Alabama to Maine – some locations in the Appalachian Mountains received greater than 40″ of snow! Strong “synoptic scale” (think scale the size of countries , so, very large) storm systems feed off temperature contrasts and March often provides just that. Stubborn arctic air typically remains firmly intact across Canada where a heavy snowpack exists that has built up throughout the winter. Meanwhile, much of the Southern U.S. propels into spring as the sun angle gets stronger by the day. The zone between these two starkly different air masses provides a perfect breeding ground for intense areas of low pressure to form producing a variety of weather from blizzard conditions to tornado outbreaks. This March is setting us up perfectly for that. Most of Canada remains buried in two to four feet of snow! This is one reason why spring is having such a hard time making its presence known across the Midwest so far this month as a mass of cold air lingers just to our north. Don’t hold your breath – I don’t see a warm spell anytime soon around here. *Notice the dense snowpack that remains across almost all of Canada: 20 – 40″+! Looking ahead, model guidance suggests we may be in for a sizable snowfall early next week (Sunday night into Monday). The exact track of this system remains somewhat uncertain as models are still fluctuating from run to run. I’ll discuss this storm in greater depth in my next post within the next 1 – 2 days. In the shorter term, expect a couple clipper systems to impact the Twin Cities in the next couple days. We could wind up with a couple inches of snow by week’s end. Winter’s not quite done with us just yet. Do you remember last “March”? It was much more like May in many respects. We had day after day of sunshine with highs in the 60s, 70s, and even an 80 degree record on St. Patrick’s Day. It goes down as Minnesota’s warmest March in history…by far. In fact, the Twin Cities ended up a whopping 15 degrees above average which smashed the previous record. Sure, it was a nice stretch. It was also an ominous sign of a long, hot summer ahead. And, it set us up for one of the most severe droughts in recent history across much of the country’s mid-section as the jet stream retreated far north into Canada very early in the growing season. From Texas to Indiana, record heat and drought plagued the landscape for days, weeks, and even months on end. *Sustained record warmth last March lead to a very early spring green-up across Minnesota. Now, fast-forward one year. Wow, what a difference a year makes! So far, March 2013 is behaving much more like a traditional March in Minnesota with snowstorms making regular visits and lingering cold air. I’ve noticed a prominent pattern change in the last few weeks to month as the jet stream (think of it as a river of wind aloft) has become more active and “amplified”. This allows the bone-chilling remains of winter’s arctic air to make periodic appearances while also encouraging gulf moisture to get drawn into spring storms. Bottom line: this spring is going to be a much different beast than what we saw last year. While it may seem depressing right now, this cooler and more active weather pattern is actually a promising sign that we may be in the midst of busting our severe drought that developed the second half of 2012. Looking ahead to the remainder of this week into the weekend. Expect clouds, flurries, and cold air to linger the next couple days as our close-call snowstorm (parts of Southeastern Minnesota received up to a foot of heavy, wet snow Sunday night!) moves east. By later in the work week, you’ll notice a nice warming trend with highs back to near 40 by Thursday and Friday. And, some much-needed sunshine! A “back door” cool front will bring the thermometer down a few notches on Saturday and Sunday but I still expect a brighter, more decent weekend ahead. *March snowstorm blanketed southeast Minnesota in 6 – 10 inches of heavy, wet snow on Sunday evening into Monday morning. Then, all eyes turn to another potential storm early next week. The details, of course, are foggy given that it’s 6-7 days out but the potential is certainly there for another sizable (snow? )storm across some part of the Midwest. Most likely timeframe for this would be late Sunday into Monday. Stay tuned! *The Euro’s forecast for early next week as another system moves across the Midwest into the Great Lakes.